You turned 7-months-old today. 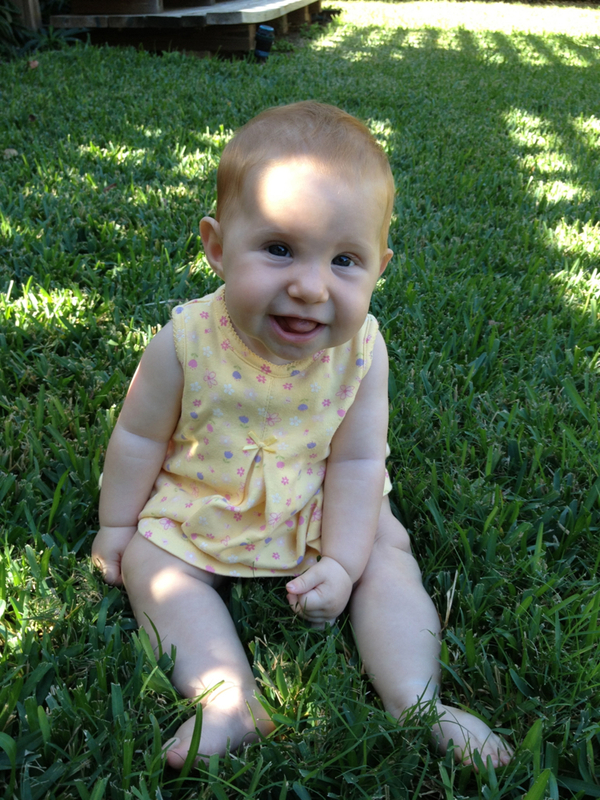 And I’ll just get this out of the way right now: you are such a stinking cute baby. You have such a positive outlook on everything. There’s not a whole lot in your daily life that doesn’t make you smile. And your smile is so damn infectious. You smile when you wake up. You smile when anyone talks to you. You smile when you’re eating. You smile when you’re talking. You have this enormous and precious toothless grin that is my constant reminder that there’s not much about which to be unhappy. This month has all been about balance and mobility. You can safely and comfortably sit up on your own now. We no longer live in fear that you’re going to topple over backwards and bash your head on the floor. We’ve tested this by propping you up on the slate tiles in the kitchen and kicking empty beer cans at your head. This month you also started really crawling. Last month you were kind of arm crawling, but now you’re able to pull your knees up under yourself, put one hand in front of the other and actually propel yourself forward. You don’t have much in terms of stamina, but you can quickly and easily get yourself across a room these days. Before I forget — What’s up with you wanting to eat my laptop’s power cord? We have four drawers in the living room that are dedicated to nothing but cute, bright, loud and fun toys just for you, but you insist on crawling over and gnawing on my computer’s cord. I even pulled out a clean, unused power cord for you to have all to yourself, and you still insist on chewing on my plugged-in power cord. While you’re a very even-keeled and happy baby, you get the most upset when you’re hungry. Whenever you start crying, I’m challenged to find the immediate source of your discomfort. Invariably it’s usually because you’re just hungry. You really like to be held, and when your mom or I set you down in your highchair, you’re discomfort will escalate, but when we start shoveling mashed fruit into your mouth, you turn back into a little angel. And speaking of eating. Whenever you’re at your spot at the table and we’re feeding you, you like to do this wrist twist thing with both of your hands. It’s like you’re in a pageant, waving to all of your adoring fans. I think it’s because you just don’t know what to do with your hands while we’re feeding you. Honestly, I’d probably do the same thing. It’s so much fun to watch you grow and learn and take in all of your surroundings and live vicariously through you as you encounter new experiences. Just do me a favor and slow down a little bit. Your old man ain’t getting any younger. Today I started on a long journey of having tattoos removed by a laser. For years I’ve thought about having them removed, and for some reason, this past week I just knew that it was time to start the process. I’ve had a lot of people ask why I want to remove them and I don’t have one definitive answer. I’m different than I was 20 years ago. The tattoos are a mark of the person that I was then. I’m who I am now, and part of who that person is today doesn’t have the tattoos that I’m having removed. The process is slow and painful. The actual treatment of the tattoo isn’t very long, as indicated in the video below. It’s probably going to take four sessions at 10 weeks apart to have the sun removed. And laser tattoo removal isn’t pain free. I ain’t gonna lie — it hurts. My new friend and laser technician, Cara, said it would feel like hot grease splatters. I’ve also heard it feels like a rubber band snapping against the skin. I’d say it felt like a long, electrified needle being pounded into your skin with a motorized ball ping hammer at a rate of 5 jabs per second. And not like tattoo needle jabs – this was like direct stabs with a long needle followed by an immediate micro-explosion in the dermis. I thought it might feel a lot like getting the tattoo applied. I think having the tattoos removed is 3-times as uncomfortable and painful. I’m a glutton for punishment though. It’s the right thing for me to do at this phase of my life, and I’ll endure the pain.